And we thought they couldn't get any cuter. In a new behind-the-scenes clip (which has no audio) taken from their first joint interview, newly engaged Meghan Markle and Prince Harry can be seen joking around, entirely at ease with each other. In the clip, which The Telegraph released Tuesday, the couple get super affectionate and poke fun at each other as they speak to the BBC's Mishal Husain. At some point during the interview, Markle jokingly rests her chin in her palm and looks playfully at Harry as he speaks. If you're not swooning by the time you finish watching the video, then what are you? In the full interview, the couple talked about how they first met, what it was like dealing with all the press when their status was blown, how they fell in love, and how Harry proposed. Harry, 33, confirmed that he proposed to Markle, 36, at the beginning of November at Nottingham Cottage, his home in Kensington Palace, while they were "roasting chicken." "It was just an amazing surprise," Markle said of the proposal. "It was so sweet and natural and very romantic. He got on one knee." Prince Harry poses with Meghan Markle at Kensington Palace, Nov. 27. The two also described meeting in London in July 2016, after they were set up by a mutual friend. According to the couple, they didn't know a thing about each other before they had met. "I was beautifully surprised when I walked into that room and saw her as she was sitting there," said Harry on the first time he saw his future fiancée. "I was like 'OK well I'm really going to have to up my game." After going on two dates, Harry said he convinced Markle to "come join me in Bostwana and we camped out with each other under the stars... then we were really by ourselves." Markle also revealed that she has left acting behind to take on her new role as an active member of the Royal Family. 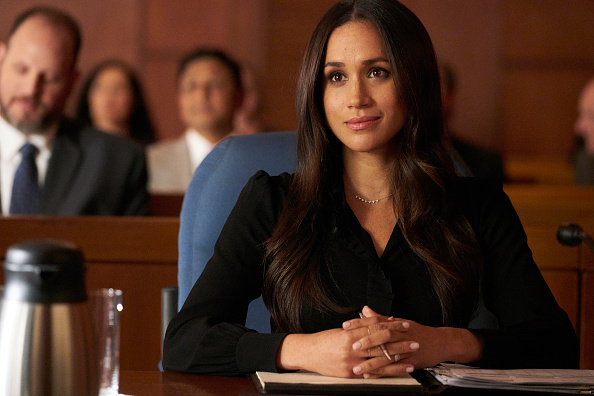 USA Network confirmed that she will not be returning to the TV show "Suits," where she played paralegal-turned-lawyer Rachel Zane for seven seasons. According to the creator of the series, Markle's character had been written out of the show as early as a year ago after he "took a gamble" that the actress' and Prince Harry's relationship would work out. According to Kensington Palace, the couple will get to work straight away, and will attend the Terrence Higgins Trust's World AIDS Day charity fair this Friday. There, they will meet with representatives from organizations that support people who are living with HIV/AIDS. The couple will wed next May at St. George's Chapel at Windsor Castle.